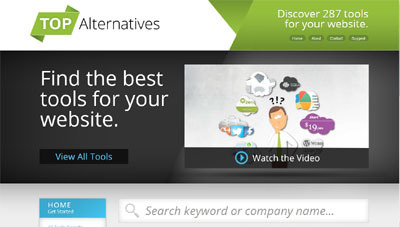 TopAlternatives.com helps web site owners find the latest software, tools, and web apps for their online business. Tools are broken up into popular categories such as SEO, video marketing, social media, landing page optimization, design, time management, WordPress, and more. You’ll find everything you need to stay competitive in today’s online world. TopAlternatives has a very strict inclusion policy and doesn’t accept any payments or affiliate commissions from the companies listed. Each company has been chosen based on a set of special criteria including online reputation, performance, design, usability, popularity, and more. The lists provided on TopAlternatives are generally restricted to only 3 or 4 of the best companies in the market. This may come as a relief to those who find it overwhelming trying to pick between 20 different companies offering the same service.